Your home should be a Joy to Live in and a Pleasure to own. A spectacular custom new home built by Pacific Ridge Homes at Canyon Rim Village in Redmond. Our Home is designed and built to provide "healthy indoor air quality", and greatly reduces expose to pollutants, allergens or forest fire smoke. This single level living boasts a great open floor plan. Entertain comfortably with island kitchen and bar seating, or take it outside to the exterior courtyard. 3 bedroom, 2 full baths, master has a beautiful walk in shower. This house has a thoughtful layout with attention to detail and landscaped yard with irrigation. Abundance of windows allows for lots of natural light. 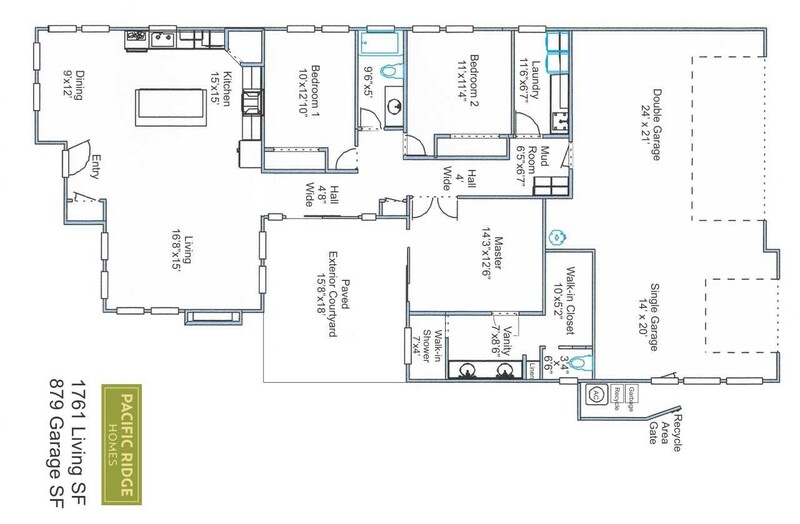 Be the first to call this 1761 sq ft, 3 car garage new contemporary style home yours. Also, for the quality discerning, this home is well-insulated to help reduce annual heating and cooling bills. For anyone that enjoys the outdoors, this home is located a few blocks away from the paved access path to the Canyon, with dog park, a bike and walking path, and more. With Pacific Ridge Homes, expect beautiful finishes and a quality build. Your home is your sanctuary, your retreat and your escape from the pressures of the world. So why not enjoy the air you breathe in your home, knowing it is not bringing pollens, allergens or other impurities from the outdoors in? Advanced Insulation and home air sealing makes your home easier to heat and cool. By this, your home's annual heating and cooling utility bills will be reduced. Committed to meeting today’s homeowners’ expectations by gaining understanding and balance between the building science of efficient heating, cooling and ventilation with the available budget. Learn what has been designed for use by builders, and economical to seal the building envelope to any desired level of tightness, including IECC, Energy Star, Net-Zero, LEED or passive house standards. Now take the guesswork out of building envelope sealing and provide guaranteed results.